Are you cutting it really close to the line when it comes to the April 21st mobile-friendly ranking change? Or is Googlebot seeming to ignore many of your pages to check and see if they are indeed mobile friendly? 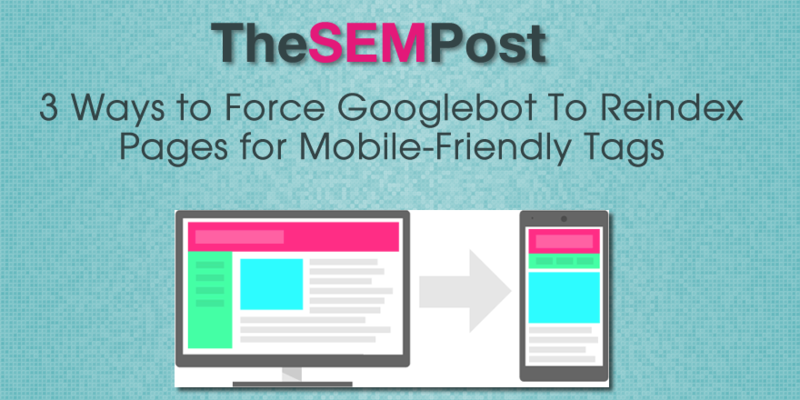 There is a way you can prompt Google to send Googlebot to reindex those pages in order to get the “Mobile-friendly” designation on the pages, which is what you need to see in order to get the ranking boost for mobile searches. In other cases, if webmasters look at their logs and see Googlebot visits their homepage twice a day, they could change their pages to mobile friendly “half a day before, and still have [the] homepage be seen as mobile friendly,” he says. The situations all vary greatly depending on the individual site, of course, but checking Googlebot crawling patterns can help you get a sense of how often the bot visits and how close you can cut it to the April 21st change. But if the date approaching and your pages haven’t been recrawled to get the mobile-friendly designation, there are some things you can do to point Googlebot in the right direction. If you have checked to ensure your pages do pass the mobile-friendly test, there are a few things you can do, according to John Mueller. Use the fetch and submit function in Google Webmaster Tools. So if you are cutting it close, or are still working after April 21st but want to get those pages the mobile friendly ranking boost, following these tips will help speed up the process, especially for those long-neglected sites that are suddenly getting mobile friendly makeovers.